Add some psionic character to your campaign! Whether your campaign is all-psionic or simply allows psionics for use, adding some psionic characters can add an extra dimension of intrigue for players who are used to NPCs always being the standard classes. The NPCs found in Psionics Embodied can serve as allies or enemies depending on the needs of the campaign, or even as an extra member of the adventure to help round out the party. Psionics Embodied takes care of the time of character building for support characters so you can focus on the campaign and get back to playing the Pathfinder Roleplaying Game! 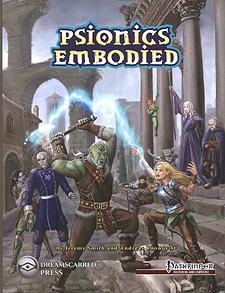 Psionics Emobdied references material found in Ultimate Psionics.